Stephen Shooster recently forwarded a 700 plus page manuscript summarizing his father Herman Shooster's background and military service with the 637th Medical Clearing Company assigned to the 3rd Portable Surgical Hospital during WWII. The hospital was attached to the 158th Regimental Combat Team during a major portion of the Combat Team's South Pacific service. 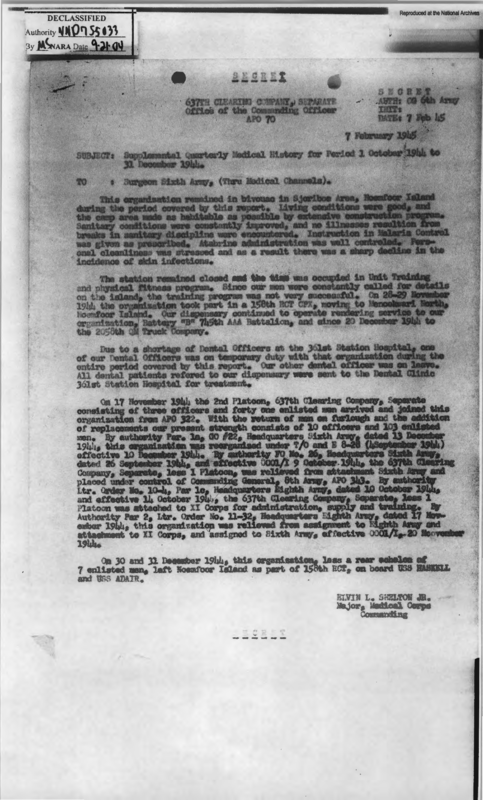 The quarterly reports of the 637th Clearing Company and 3rd Surgical Hospital illustrate the role of medical service personnel during combat from the unique perspective of two unit commanders. The unusual story of a casualty named "Blue Eye" is outlined in the 2nd paragraph of the hospital report. 30. The company of infantry that was with us moved out and left us with a collecting company. The RGT Headquarters was about three miles back of us closer to Manila road. We woke up one day being fired on by the machine gun of their perimeter. Running across the field in the clear were two scraggly Japs who had tried to infiltrate the 148th Field Artillery. They ran through our area, by the collecting company where two of their men pinned them down and killed them, all in view from our cots. We received several criticisms from the infantry, particularly the collecting company, for firing our guns. Combat medics! 32. On March 4th, we received orders to join the 158th RGT at Balayan. We evacuated our patients and departed on the 5th in 2-½ ton trucks borrowed. from the 148th FA Bn. The road was first to Manila, which required hours longer than necessary because the road was filled solid with civilians, going and coming, in small two-wheeled, horse-drawn, carts, in carabao-pulled carts, in pushcarts or walking coolie fashion loaded down with bags of belongings balanced on poles over the shoulders. 33. Manila itself was crowded as we passed through, particularly the north side bawdyhouse districts and cheap shops district. Toward the center of the city and. across the river by the walled city, the buildings were completely demolished, burned out, still smoking, and malodorous. The Army was busy with bulldozers clearing the streets and putting in permanent communication lines. We passed through the south side by the race track, polo field and residential districts and found destruction and waste everywhere, but happy civilians. We had never seen anything comparable to that burned out, destroyed city. 34. Soon we had gone way south to the hill road above Lake Taal, which was beautiful and cool and appeared out of the war, and continued downhill until we arrived in the town of Balayan and reported to General MacNider. The document memorializing Herman Shooster's life and WWII service provides insight to both civilian life and military service during a historic period in our Nation's History. Thanks very much, Stephen for preserving and providing this especially interesting portion of Bushmaster History. Fort Tuthill Military Museum. Regimental Museum 158th Infantry. Bringing Arizona's Proud Military History Alive. 2446 Fort Tuthill Loop Rd. Thanks for filling out our contact form! We will respond to your request promptly.